And that’s why you need to be there when Dept Festival returns to Thuishaven Amsterdam for the fourth time. We’ll help you immerse yourself in an energetic and inspiring variety of digital experiences. Featuring hands-on practices, on-the-spot creativity, and – of course – mind-blowing talks. Beyond that, be prepared for the double D: Drinks and Dancing… Yes, mark September 6, 2019, with bright Post-its and lots of exclamation marks. "Happiness is not something to search for - just open your eyes." With his spontaneous and compassionate way of teaching, Tulku Lobsang Rinpoche is considered one of the most successful Tibetan Buddhist teachers in the West. In this 45-minute talk, Tulku Lobsang offers practical tips and insights on how to become, be and remain happy & healthy in today's busy world. Becoming a viral sensation overnight. Jordan flys all the way from Auckland to Amsterdam to tell you everything about his inspiring story. In 2015, he created his first comical parenting video, and since then, the ‘How to DAD’ videos have amassed over 220 million video views. Today, he can also add two “instructional” books to his portfolio and is followed by over two million people on YouTube, Facebook and Instagram. How awesome is dad? How can data visualization help us better understand the world? And what do toothbrushes and front doors have to do with it? As a Co-Founder of the Stockholm-based fact tank Gapminder, Anna’s mission is to show how the world is less divided than we think. In her talk, she will elaborate on the more than 30,000 photos she collected and how this contradicts the oftentimes deviating image news media convey. Erik is a genuine all-rounder that engages in the full range of creative activities. As the co-founder of the renowned ad agency KesselsKramer, he and his team create meaningful print- and TV campaigns for international brands and organisations. But wait, that’s not all. As an artist, collector and curator of photography, Erik has also published more than 50 books, and was called a ‘visual sorcerer’ by Time Magazine. What’s not to love? The secondary sneaker market has gone from an underground aficionado scene to a billion dollar industry. Lifelong sneakerhead and CEO of StockX Josh Luber saw an opportunity and created Campless, the Kelley Blue Book for sneakers, using data to determine the true market price of sneakers. StockX is a revolutionary live marketplace for buying and selling sneakers, streetwear, watches, and handbags. So if you’re curious whether reselling sneakers is more The Wire or Wolf of Wall Street, join Josh and walk a mile in his Black Cement 3s. A “Hero of the Environment”. That’s how Time Magazine views Michael. And we cannot wait to have him as a speaker! As a climate policy expert, he is one of the strongest advocates of nuclear power. In his talk, he will explain why we don’t have to be scared of the technology. Did you know that an area twice the size of Europe can go from barren soil to bounty? All we need is a shovel. Curious how we can dig our way to water, food, a better life for millions of people and even a cooler planet? Wessel van Eeden (Justdiggit Marketing Director), Tess Milne (Justdiggit ambassador) and Tim Dekens (Dept) discuss how a healthier planet is just a shovel away. CANDY SAYS dj team consist of Bella Hay (Tears & Marble) and Maurizio Pinna (The Deaf). 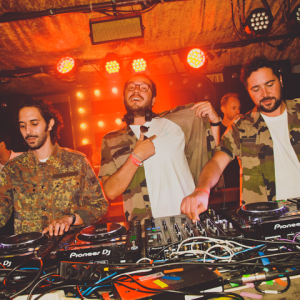 They breaks the monotony of regular clubbing by offering a wide mix of styles and genres like Rock, Pop, Indie, Garage, Electro or whatever it takes to keep the people jumping. Since 2013 they have played at practically every club/venue worth mentioning as well as a lot of major festivals such as Lowlands, Down The Rabbit Hole and Best Kept Secret. Come for the cat gifs and stay for a history of Machine Learning through Luis' University of Maryland, Microsoft, Workpop, Reddit and Novi experiences. After building the ML & Data disciplines at Reddit to revolutionize the frontpage of the internet, Luis co-founded Novi Finance where he is rethinking banking. Originally from Brazil, Luis can now be found exploring San Francisco with his Siberian Husky, Vix. Lisanne is a data analyst with a penchant for patterns. She's been researching what machine learning can do for our business as well as our society. It seems like computers can do what we can, only better. But are computers the impartial judges we think they are? After all, they learn from us. Time to explore the morality of machine learning – while we can still correct our course. When we say 'developer’, you picture a man, scruffy beard, conference t-shirt, empty energy drinks on a cluttered desk, keyboard on the belly, doing things too complicated for us to conceive. But who are they? What are they doing? And if this is the 'developer' species, how can we interact with them, work with them, or even (imagine this) become one of them? Today: Daphne will be your guide for this hidden world of developers. Bring your beard, your belly, your funny t-shirt - and try to fit in. Eurosonic Noorderslag, De Parade, Glastonbury, and now, Dept Festival! Bo, Ko, and Dirk from Brass Rave Unit are anywhere that people want to dance. Set with a trumpet, a saxophone and a drum set, they deliver high octane muscle and lung powered raves, that make you ecstatic and unable to stand still. Curious how the impressive screen graphics for Blade Runner 2049 were designed? And what challenges arise when designing for a fantasy world? David is Co-Founder and Executive Creative Director of Territory Studio and a welcome guest at various international creative festivals. His passion? Storytelling, technology and emotive design. Marcel founded his own agency, a friend of mine, 7 years ago. He credits its success to a strong company culture. A company culture he was very proud of – and that was challenged when a friend of mine became a part of Dept. What do you do when two cultures clash? Can you say goodbye to a legacy? Is creating a new company culture a zero sum game? Marcel shares his experiences. Our time is limited. We are all aware of that (sort of, sometimes) but we don't seem to act like it. Franklin makes us face the facts: technology was supposed to save us time, but instead it's making us waste it. Join Franklin for a stark reminder of how much time we've got left and how we want to spend it. As digital creators, can we be part of the solution? Can we save ourselves time? Attend. Take the time. Marieke has a job. Now the first thing you're asking yourself is: “What job?" But what would that tell you about Marieke? Generation Y often finds it difficult to distinguish between professions and identities. But what does all our hard work really get us? Is your job supposed to make you happy? All good questions. Marieke's got hard-earned answers. Take some time off and find out. What's the difference between an immigrant and an expat? Not an easy question, and it doesn’t have an easy answer. Emmie started with a utopian vision of diversity in business. But the deeper she delved into this concept, the more complex it became. Now she's ready to share her findings. Is a win-win solution in the cards or is there a reason we haven’t figured this out yet? Join Emmie as she explores what we ought to give. And what we stand to gain. The customer is always right. But do we give them what they think they want or what we know they need? That's where Mewael and his microwave meal theory come in. Mewael began his career heating up dime-a-dozen content for happy clients, and they ate it up. But Mewael was no longer satisfied with easy choices, and started crafting haute cuisine solutions. Is it really worth it to stop cutting corners and to take the long scenic route? Let Mewael convince you. When we support a charity we usually do so with money. Tim decided to take a different approach to philanthropy. As a designer, he's been working with shovel-centric climate savior Justdiggit. And while Justdiggit isn't in the game to make money, Tim is. Because you can make a profit while making the world a better place. In this short film, he shows the impact of his work for Justdiggit. And how doing the right thing should be give-and-take. Winning awards, getting the pitch: we know how to celebrate the big wins! But David reckons that it's not just the big stuff that's worth breaking out the champagne for. It's easy to get hyped for awards, but it might be more important to note everyday victories and small steps forward. Find out how celebrating the small stuff makes us feel better, appreciate each other, and get more work done. Did you just put it in your planner? Hey, good for you! We are social creatures and we want – above everything else – to fit in. Tijana knows all about that. Born in the Netherlands to non-Dutch parents, she's been fighting to fit in all her life. After all, different groups come with their own values and standards. We all know that fear of introducing your various cliques to one another at your birthday party. For all of you wanting to fit in or stand out, Tijana has comforting words. And what's better: she's got tips. After sleep, we spend most of our time on our phones. So even though you've heard it before: mobile first! While AR, AI, and IoT are taking its place as catchphrase du jour, Mike isn't ready to call it quits. After all, these devices are in our hands all the time. But mobile visits are often frustrating and fruitless. When did you last try to buy a ticket on your smartphone only to sigh wearily and switch to your laptop? After years of experience with KLM and Coolblue, Mike is here to smack some sense into us. We do stuff. And when we are done - we do the next thing. Marathon finished? Sign up for Iron Man. Email answered? Check if we have a new one. If not, check something else... Wouter did the same. House, kids, dog, job, hobby, and a new one - check, check, check, check. But then, when he was falling out of a plane, it hit him: a minute can be 60 separate seconds that last for hours. He found a way to make minutes last, instead of just going to the next one. Invest some minutes to find out how. Fortunately Casimir was not sedated with Ritalin as a child, so he was free to bob and wriggle against the rhythm of the world. The German DJ is happy to be a resident of the famous Harry Klein Club in Munich and is a tireless advocate of House music of every shade and color. Casimir also produces and releases music as one half of the duo Lucid Soul. This is our House and our House Music and Casimir knows how to handle his House vinyls. There is someone who has it out for you, and they're standing right where you are. Daniel exposes the inner saboteur that is your brain. Always one step ahead of you, sabotaging your resolutions to get up early, eat healthy and save money. But there are ways to outsmart our brains. After many cold showers, anti-snooze solutions and forays into his discomfort zone, Daniel has some advice for the rest of us. Pick a fight with your brain – for fun and profit. Philip Missler is the director of the Amazon Media Group Germany & Italy. No small fry in a world where you buy your laptop, your leggings, and your laundry detergent online: often even in the same shop. Be there when Philip delves into the intricacies and possibilities of eCommerce and eCommerce search. And that twitchy index finger you get when you see an ad for something you never knew you wanted. During this live recording, Alexander Graf, one of the top e-commerce minds in Germany, and Dept's own Data & Intelligence Director Willem Blom will meet with some of our favorite commerce gurus for a discussion on fresh commerce models and innovative growth opportunities. The podcast series is based on the biggest podcasting show about e-commerce and digitization in Germany: kassenzone.de. Bart is our host at the Green Stage. As Co-founder of Dept Agency and superhero of technology and innovation, he knows what’s going to happen next, and what questions to ask if he doesn’t. A veteran in the industry, always looking for smarter and better. He’s the kind of guy that buys shares in Shell to get them to go sustainable. With green blood pumping through his veins, he will make you feel right at home at the Green Stage. We can imagine that you want to be there. Unfortunately this is an invite only event. But if you are sweet to Jozien, she can maybe arrange a ticket for you. Contact her by phone or email and let her know why you really, really want to be there.